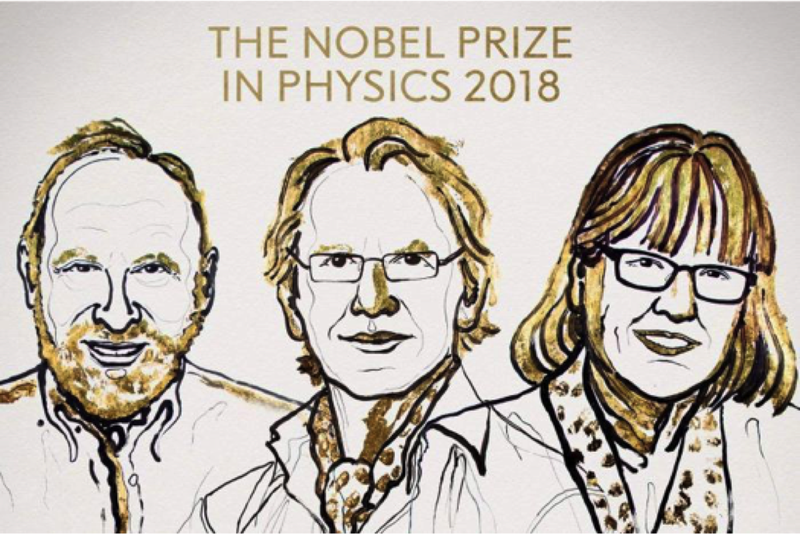 You might have seen yesterday’s announcement of the 2018 Nobel Prize for Physics. Here’s my attempt to explain the work of two of the recipients, with a bit more detail than most of the press releases – but hopefully not too much physics jargon. Why were Donna Strickland and Gerard Mourou Awarded the Nobel Prize? In 1985 they invented the technique of “chirped pulse amplification” (CPA) which made it possible to generate laser light pulses of extremely high intensity and extremely short duration. What’s so Great About Short Duration Light Pulses? Light pulses that persist for only a very short time have many applications. For example, the speed at which data can be sent via the internet depends on the number of separate laser pulses you can send down an optical fibre in a given time: this web page reaches you on the back of laser pulses each of which is shorter than a thousandth of a millionth of a second. But modern “ultrafast” lasers can generate a flash of light that lasts only a few femtoseconds (or less): a femtosecond is a thousandth of a millionth of a millionth of a second, or 0.000000000000001 seconds. This time is short compared to many processes in physics, chemistry and biology, so femtosecond laser pulses make a great ‘stopwatch’ that allows us to study, for example, how long a pair of molecules takes to react, or how long the initial stages of vision take within the human eye. Such times are much too short to measure directly, but a stream of femtosecond light pulses can make the process visible on slower timescales, in much the same way that a strobe light in a disco seems to slow down the movements of a dancer. What About the Very High Intensities? A continuous (always on) laser beam with similar power to a domestic light bulb, if tightly focused to a small spot on a material, can cause damage or even cut through materials such as steel. The energy from the light melts the material rather like a blow torch. In an ultrashort laser pulse, the energy of the light is concentrated in a very short but very bright flash, and the effect on material is more like a lightning strike. The laser pulse may have enough energy to directly vaporise material, or even to rip apart atoms. A consequence is that laser cutting of materials is much cleaner and more precise when ultrashort pulses are used, and femtosecond laser micromachining has quickly become a standard manufacturing process. Another well-known application is in corrective eye surgery, where a femtosecond laser is used to precisely cut a flap in the surface of the eye, before reshaping of the underlying material and reattachment of the flap; here the reduced damage of surrounding areas is an important advantage from the use of ultrashort laser pulses. Another use in scientific research is the generation of light pulses with a wide range of colours (wavelengths from the ultraviolet to the far-infrared). Light pulses travelling in certain materials can change their colour, and the more intense the pulse, the more efficient is the colour conversion. The response of materials to the different colours (‘spectroscopy’) can be used to identify or characterise the materials. How Does Chirped Pulse Amplification (CPA) Work? Lasers and laser amplifiers make use of a process (predicted by Einstein in 1917) called stimulated emission, where under special conditions a material can make copies of the packets of light that pass through it, leading to an increase in the intensity of the light beam. The difficulty in amplifying short, intense light pulses is that they damage the material they pass through, so there is an upper limit on the intensity that can be reached. Strickland and Mourou overcame this problem in a very clever way, that made use of the fact that a short light pulse always contains a mixture of colours. It has been known since Newton’s experiment in 1666 that passing light through a prism* will separate the different colours, which can then be made to travel along different paths before being reassembled into a beam by a second prism. The red colours can be made to arrive before the blue colours: this changing colour (or frequency) of the light is a bit like the change in pitch of a note in a bird song – hence the name “chirp”. Because the energy of the pulse has been stretched in time, its intensity is reduced and it can be safely amplified. The amplified chirped pulse can then be passed through a pair of prisms that are a mirror image of the first pair, which reassembles the different colours back into an ultrashort light pulse, that can be many orders of magnitude brighter than the initial pulse. CPA laser amplifiers are now commercially available in table-top systems that are widely represented in research labs including the Advanced Technology Institute at the University of Surrey (https://www.surrey.ac.uk/photonics-quantum-sciences-group/facilities/ultrafast-laser-laboratory). Such systems may have peak powers of a few Gigawatts (a thousand million Watts) – comparable (for a very short time!) to the output of a nuclear power station. Large scale facilities such as the Vulcan laser at the Rutherford Appleton Laboratory (https://www.clf.stfc.ac.uk/Pages/Vulcan.aspx) achieve quite staggering powers in the Petawatt range (a thousand million million Watts or 1,000,000,000,000,000 Watts). Such intense light pulses can be used as compact particle accelerators, or as sources of bright X-rays that reveal not only the structure of solids but also how they move. They can recreate, within the laboratory, conditions similar to those inside stars or in remnants of supernova, or be used to contain nuclear fusion reactions. By a technique called harmonic generation, even shorter (attosecond) light pulses have been produced that allow the motion of electrons in atoms and molecules to be tracked. Even more powerful systems are under construction, in facilities such as the Extreme Light Infrastructure project (https://eli-laser.eu/the-eli-project/), and will open up the study of extreme states of matter as well as future applications in fields including oncology and medical imaging. (*Strickland and Mourou used a diffraction grating instead of a prism, but the principle is the same). Why are Female Physicists in the News? Shockingly, Donna Strickland is only the third ever female recipient of a Nobel prize in physics – although it is not difficult to think of worthy candidates. Today’s news comes shortly after media reports of some daft comments on the contribution of male and female physicists made by a Professor from Pisa University at a workshop organised by CERN (https://www.bbc.co.uk/news/world-europe-45703700). But amongst the media noise it’s important to remember that the 2018 Nobel prize was awarded to Donna Strickland due to the originality of her research and its profound implications for science and technology.